we are extending it to August 15, 2007 - Click Here for Details! During WITI's membership drive you can get a lifetime WITI membership for just $1,000. Click here for complete details. How much do you really need? How many rounds? And from whom? Getting money is not difficult, but getting the right money at the right time on the right terms is what matters. Darts? Or Magic 8 Ball? Too many entrepreneurs use one (or both!) of these time-honored techniques when seeking investors. This is insane. In an emerging global economy traditional leadership qualities are being redefined. For today's business leaders it is no longer enough to only focus on domestic issues. As technology continues to improve and global outsourcing becomes the norm, international business deals have become very common. "I think leaders today have to really think in global terms," said Art Data, CIO for Navistar Information Systems. August 2, 2007 • Los Angeles • Register Now! This is an annual favorite, with a big turnout. So register early! Join us for a fun evening of networking and socializing with the tech savvy community of Los Angeles! Come one, come all, bring your business cards, and schmooze with us as we enjoy the summer weather and good company! Complimentary Hors d' Oeuvres. Cash bar. Bring a light sweater/jacket as the event is outside. Sharon Elshaug, Principal of Insightful Solutions, Inc. (www.insightfulsolutionsinc.com) has been invited to lend her expertise as an Advisory Board participant in development of California State Fullerton Extension's newest certificate program. According to the US Department of Labor, the need for business analysts in the state of California will increase by 21% in the next seven years. To this end, University Extended Education (UEE) is developing a new non-credit Business Analyst Certificate program that addresses the needs of large corporations to maximize their resources and examine and address operational problems. 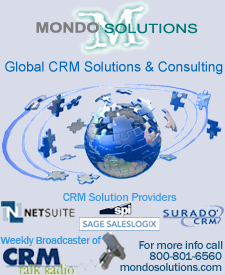 Established in 1995, Mondo Solutions has become a worldwide leader in providing CRM Business Consulting Services and CRM Solutions for Sales, Customer Service and Marketing organizations. CRM Solutions include Sage SalesLogx CRM, Sage CRM, Netsuite, Surado CRM and Sales Methodology Solution Selling. Accenture is proud to host the Chicago Regional Network Event next Thursday, July 26th - How High-Performance Businesses Differentiate Themsleves. If you will be in the Chicago area, please join us for a night of networking, learning, and fun! Jeanne Harris, Director of Research at the Accenture Institute for High-Performance Business, will share key messages from her new book Competing on Analytics: The New Science of Winning and will explain how many successful organizations are using data creatively to beat the competition. Also, take a tour of Accenture's Customer Innovation Network. The Accenture Customer Innovation Network is an interactive facility demonstrating the leading-edge concepts and technological innovations that empower customer centricity in the changing marketplace. Stanford University • Palo Alto, CA • Register Now! As those who have attended any of the four annual Stanford Summits know, the Stanford Summit is a two-and-a-half-day executive gathering that highlights the significant economic, political and commercial trends affecting the global technology industries. The Stanford Summit features the most innovative companies, eminent technologists, influential investors and journalists in keynote presentations, panel debates and private company CEO showcases. The Stanford Summit's goal is to identify the most promising entrepreneurial opportunities and investments in the global tech industry. So mark your calendar, and click here to take advantage of the 25%-off ticket we have reserved for you before it expires.